• The less expensive the better. • Built in a short period of time. • It had to be energy-efficient. At our client’s demands we designed a house made of six modules and the space among them. 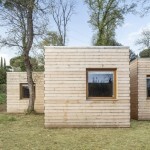 The modules are made of wood and completely prefabricated, with no need of later finishing fieldwork; and flexible enough to adapt to the morphology of the site. 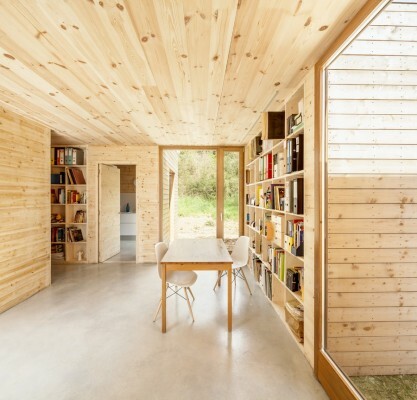 The bioclimatic study of this exact site is crucial to decide the strategies to follow in our design, in order to improve the comfort of the dwelling and to achieve the energy demands to be a passivhaus. Keeping in mind the possibilities of transportation and the passivhaus characteristics we drew six modules which will adapt automatically to the solar and to the existing trees. The interstitial spaces among the modules give the interior a flexible use for the comfort of the family and become a solar light collector in winter, like the greenhouse effect, due to the glass walls. In spring and summer they can transform into roofed terraces next to the garden, when temperature is nice. 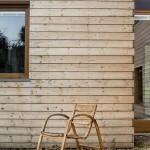 The design features an intense relationship between its occupants and the nature around. 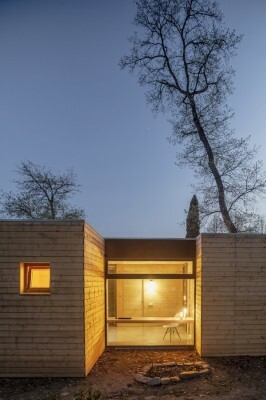 So the relationship between the house and the Montseny green landscape becomes one of the main focal points in this work. 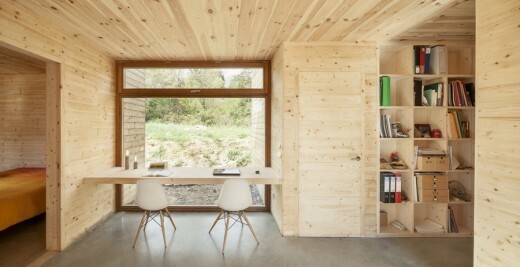 The wood structure and walls and the strikingconcrete floor blend into the overall configuration of the interior. 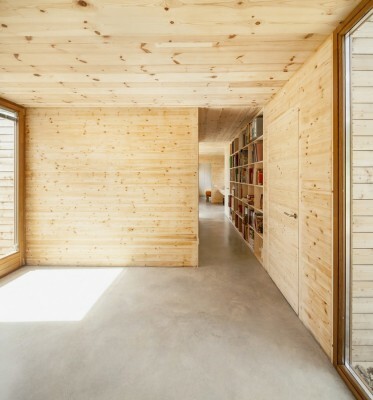 The use of wood as the main material makes the relationship with construction experts easier, and let us optimize construction details and costs. 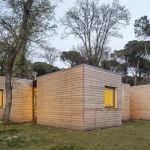 • Reduction of ecological effect due to the use of materials from the surroundings; so natural, recycled and with the minimal impact. • We prevent condensation by using sweating materials, to have a healthy house. 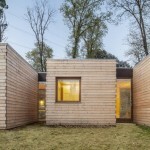 • The use of 76,77% less energy to heat the house, in comparison with the same house built in the traditional way. So we have an energy-efficient dwelling. 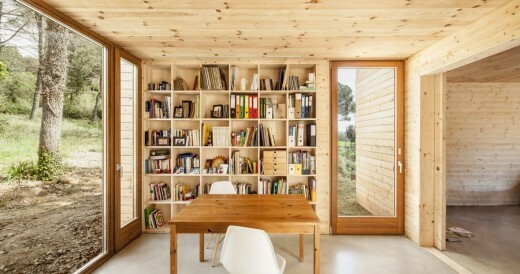 Architects: Alventosa Morell Arquitectes ( Josep Ma. Alventosa, Marc Alventosa y Xavier Morell ). Location: Santa Maria de Palautordera, Barcelona, España.